We are the official Australian and New Zealand distributor of premium global brands : Dermaceutic®, LMX4®, OC Eight® and Retriderm®. 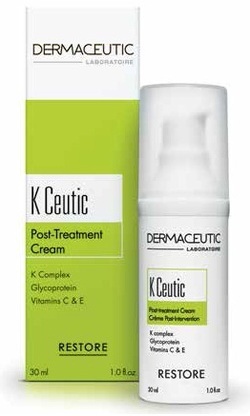 • A highly nourishing cream after peels, laser treatment or surgery. • Free of fragrances & parabens. - The repair complex, containing glycopprotein, hyaluronic acid and silanol, helps restore the epidermis and promotes skin regeneration. - K Ceutic has a soothing and calming action. It restores the skin's surface microcirculation which reduces erythema and oedema, eliminates red patches and skin irritation. - The protective complex containing soy flavonoid liposomes that combats irrregular pigmentation.